Though it has not been immune from development, the West Coast fishing village of Paternoster, 120km north of Cape Town, has maintained much of its charm. White-washed, self-catering cottages for holiday hire now concentrate along the beach. At least the buildings are pleasingly small and sympathetic in scale to the flat almost endless stretches of blinding white sands that make this barren coast so scenic. You might not want to be caught here at the height of the summer season when the place becomes a parking lot for coach tours. The second you open the car door you are besieged by offers of fresh crayfish and mussels, presumably hidden in the plastic bags the local urchins hold up to view. There are other good reasons to visit. As you enter the town, you will find on your left the Oep ve Koep general dealer store, a relic from a bygone age still surviving. Behind the store is a tiny bistro, seating at a big push 30 people, though the chef-proprietor silently hopes he will never have to entertain such numbers. 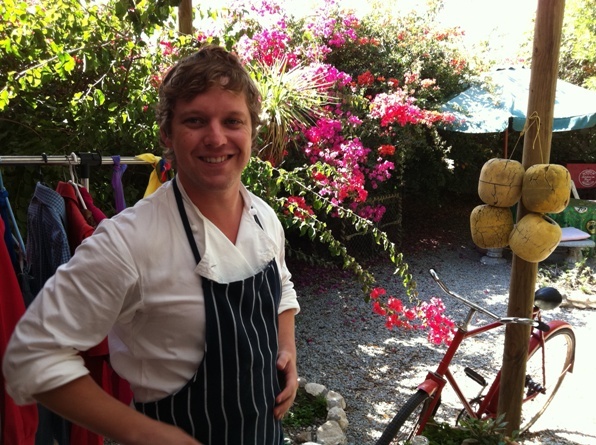 Chef Kobus van der Merwe runs a one-man show. His kitchen is neatly organized with a small office at the back. The batterie de cuisine is certainly modest, but what this chef has is a superlative command of presentation and an acute sense of taste and balance. Most importantly Van der Merwe has a yen for adventure to match his remarkable palate. Here all the elements for a good story come together; he is what food critics like me dream of finding. 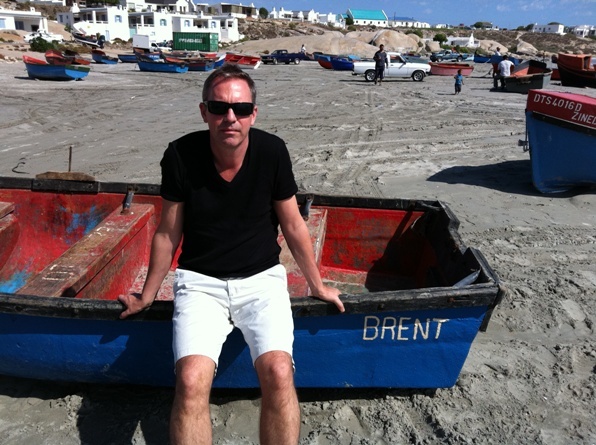 He is world famous in Paternoster. His operation (started last season) is artisanal, intimate, personal, and off the beaten track, yet the finished product is consummately professional. A plate at Oep ve Koep looks as if it came out of the kitchen at Jardine’s. Best of all, Van der Merwe is forging a new cuisine, introducing us to tastes most of us have not previously experienced, and he is doing it with ingredients indigenous to the Cape. In the gravel courtyard at the back, fringed with multi-coloured bougainvilleas, and surrounding a manatoka tree are a few stone chairs and tables covered by funky tablecloths, sporting such themes as Facebook or Football. A small striped field mouse, courageously diurnal, seemed to have free reign outside. On the border of the dining area, a vegetable patch and organic herb garden are cultivated in old wooden fishing boats, to which the chef makes intermittent trips during the course of the meal. In pots beside the kitchen door he keeps edible fynbos. You will find wild sage (salvia africana), dune salvia (salvia africana lutea), Cape sour fig (carpobrotus edulus) and its relative the Eland vygie (carpobrotus quadrifidus) with bigger fruit and yellow flowers. There is dried red seaweed, “klipkomberse”, sea lettuce (a bright green, edible algae that looks remarkably like lettuce) and some fynbos herbs used to smoke food. The curiosity to see what he will produce with all this certainly excites the appetite. While we consult the menu, three of us unwind with doorstops of white plaas brood and a very fine chenin blanc from the tiny Secateur’s Estate in Paardeberg, with the claim on its label that it is “handmade” (or should that be foot-made, one wonders?). As an amuse bouche on a block of painted white wood is crumbly porcini mushroom ‘soil’, sour fig, freshly picked rocket, and moskonfyt (a Cape grape must jam, once ubiquitous and now increasingly hard to find). The menu, chalked on a blackboard, varies daily. Choice is easy; we decide to have everything. For starters, a West Coast salad (R40) with slices of quince balanced with segments of grapefruit, feta to add body, and descriptively called seekoraal (as it looks a bit like fingers of thin coral). Also called sea asparagus or samphire (salicornia)it grows in very specific patches along the coast and even further inland in brakish vlei waters. The other starter, strips of calamari (R40) in a bowl of hot and sour broth garnished with coriander was inspired by local “kreef” curry, but Van der Merwe is allergic to crayfish. We also opt for a main course to share as a starter – bokkoms (salted and wind-dried fish fillets) from massbanker (horse mackerel) slightly reconstituted in a marinate of olive oil and lemon juice then panfried and served on thin slices of toast with green apple slices, citrus beurre blanc, basil, poached egg, seaweed garnish and a few gooseberries. It is a main, but unless you have acquired the taste for bokkems, which I recall years ago hanging above bar counters like tobacco leaves in rustic pubs, the fish will be too pungent. Using thin slices instead of the whole fillet would make this a perfect dish to my taste. The main courses: ‘Paternoster palak paneer’ (R55) made from homemade buttermilk ricotta, topped with buttermilk ice-cream and accompanied by dune spinach (tetragonia decumbens), which is wilted slightly; raw, it is bit wooly; blanched, these bright green leaves make a succulent warm salad. The young tips of the plant are cooked in the masala sauce. Sandveld potato dumplings in a Polish style (R60), are shaped almost like oversized ravioli, sprinkled with whole blanched almonds and mangetout, ladled with a sauce of mushroom and herbaceous, slightly nutty purslane (in French porcelaine). A square of beef bobotie garnished with baby nasturtium leaves is accompanied by beetroot, cabbage and apple, a condiment of fruit chutney made from peach and prune, and a delicate sambal of coconut and banana. Umqa (R48), made from Invicta maize rice meal, is traditionally cooked up with pumpkin and butternut. Van der Merwe has transformed this by cooking it as a creamy risotto, adding wine first and then ladle by ladle, chicken stock. The finished dish adds slow roasted tomato with a little balsamic vinegar, combining familiarly with the parmesan. For dessert there is a choice of sorbets, including rose geranium (pelargonium graveolens) and such unusual but successful combinations as grape and olive oil with basil; pineapple and lemongrass. He also makes an avocado sorbet, but it is not served as a dessert.Finally there is honeybush tea panacotta (a reduced cream) and moerkoffie. This is one local gastronomic experience not to be missed. Oep ve Koep Bistro, Saint Augustine Road, Paternoster, Tel 022 752 2105 . Open Wednesdays to Saturdays for breakfast 9–11am; lunch 12:30–2:30pm; Sundays from 9–10:30am and noon to 2pm. Edit: This article first appeared in the Mail & Guardian on 13 May 2011. See also Kobus’s beautifully illustratred blog: Sardines on Toast.